This addin provides support functionality for the West Wind Web Connection Visual FoxPro library that interfaces FoxPro code with ASP.NET Web applications. 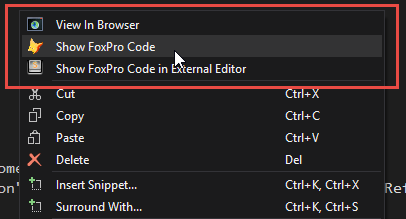 This addin provides the ability to open FoxPro source files, and browse Script, Template and Web Control pages directly from within Visual Studio. Depending on which type of file you have open only some of these options are available. Scripts and Templates only show the View In Browser option, unless an optional SourceFile comment is added. Web Connection Control Framework pages see all options for browsing and editing.